This is a photograph album created ca. 1925 by Emily Ada Smith. Smith was approximately fourteen years old at the time. This item contains 25 photographs, all from the early 1920s. There are no captions or labels. 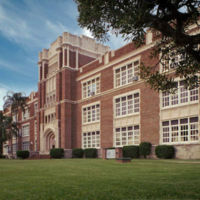 Constructed in 1927, this was the main building of Sarasota High School in Sarasota, Florida for many decades. This is a panoramic photograph of city skyline of Houston, Texas, in 1911. When compared to other photographs of Houston from earlier and later dates, this shows the change that the downtown center of the city went through over time. Tupperware: The Nicest Thing That Could Happen To Your Kitchen! The Nicest Thing That Could Happen To Your Kitchen! This photograph depicts the winners of the Philip Morris Scholarship. Notice there are two white women recepients.